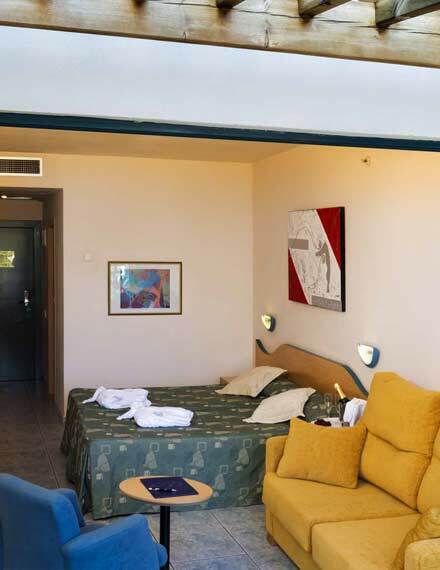 Among the hotels in Gandia, Hotel Principal offers 179 comfortable and bright rooms distributed on 12 floors. 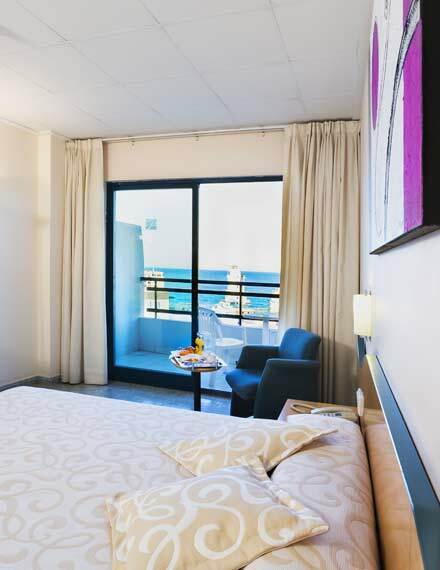 We have double, triple, quadruple and superior rooms, all with terrace or balcony. Some with sea view, some with mountain views and some with no views. 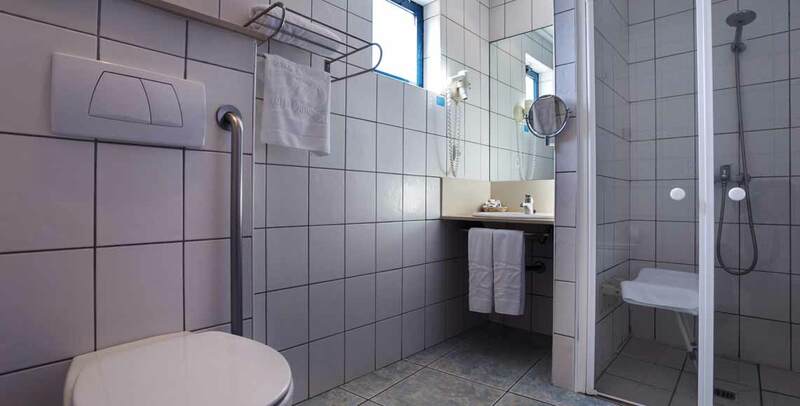 Rooms for work trips, comfortable rooms for families with children, adapted rooms for people with mobility problems or rooms with Jacuzzi for couples. The rooms can be hired on a bed & breakfast, half board or full board. Check the offers , deals and promos of our hotel in Gandia . (*) If you are a regular customer book on our website. Then in the last step of the web booking process you will be asked, among other data, your ID and date of birth to apply an automatic -5% discount. 26" or 32 LED TV "
Double rooms with balcony or terrace, two single size beds, 26 " LED TV, free WIFI , with bath, shower or jacuzzi and room service available. Those with sea views include DREAMPROTECT comfort mattresses of 100cm. wide X 200cm. long. They are well suited for those who are traveling alone for work. For couples on holidays or on weekends with their baby or child , we offer standard or superior double rooms (2 + 1 people), to which we can add a travel cot or an extra bed for children up to 12 years. We have triple rooms for families with older children or a group of friends. They are double rooms wider for 2 + 1 persons with a person sleeping in a temporary bed or in sofa bed. Those are rooms with balcony or terrace, two single size beds + one temporary bed (or a sofa bed), 26 " LED TV, free WIFI , with bath or shower and room service available. Those with sea views include DREAMPROTECT comfort mattresses of 100cm. wide X 200cm. long. We have also quadruple rooms but only on request . They are double rooms wider for 2 + 2 persons with 2 beds + 2 temporary beds. Please call, phone or sent an email to book your quadruple room. For the most demanding we have created our superior rooms. They are located in the higher floors of our hotel, overlooking the sea or the mountains. Their distribution in 2 separate spaces sleeps up to four (4) people and two (2) people feel at home. Each of these two spaces have their own TV. Those are rooms with balcony or terrace, a king size bed equipped with DREAMPROTECT comfort mattresses of 150cm. wide X 200cm. long, two 32 " LED TVs, free WIFI , with bath or jacuzzi and room service available.